An excellent and easy-to-use mashup from Box Office Quant pinpoints the locations where scenes from more than a thousand movies were shot. 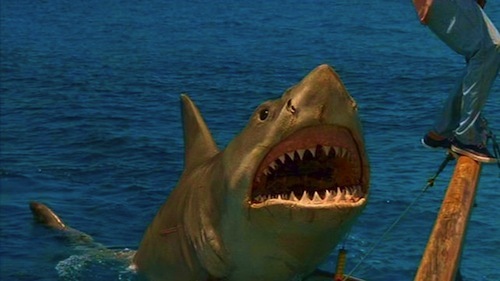 How else would I have ever known that a scene from Jaws II was filmed mere miles from where I grew up? Or that the slumber party scene in Grease, one of my all-time favorite movies, was shot in a home just a few blocks from where I now live? Check out your neighborhood – you might be surprised at what you find! Central Kentucky basically has Seabiscuit, some scenes from Goldfinger , and a bunch of different stand-ins for Elizabethtown, a movie people tend to have seen on an airplane, if at all, apparently about how weird it is when you’re Reese Witherspoon (or someone like that) and go back to Kentucky after years of living somewhere movie audiences have heard of. God, that was a good party. Until Little Miss Sandra Dee came out of the bathroom all doe-eyed and annoying. Wonder what I did with that wig. How come nobody’s commenting on that awesome photo of me? I’d just had my teeth whitened. You know who I miss? The commenters of yore. I miss Marleyfan. I miss Rogan. I miss Kate the Great. I miss G-lock, Bacon, Ivy, T-Remain, Dorothy Gale, Beth W, Ruben. So many great comments. So fun to refresh and see who’s in the conversation when they were in the game. You know who I love? AWB. Smearcase. T-Wag. J-Man. Scottiegee, Steph, Rachel. I love all our current commenters. But dang, I miss the lively back-and-forth. Have you ever checked out the “From the Archives” posts in the right sidebar of the homepage? Good stuff. “A League of Their Own” filmed a few scenes in my hometown. It’s sort of cheating, but I live about 2 blocks from Paramount Studios, so there are about a thousand movies I could name. I will mention three: Rear Window, Sunset Blvd., and Double Indemnity. P.S. Rizzo! How’s it going? Why dontcha ditch Miss Lousy with Virginity and come on out for some fun? Aww, i’m still around, lurking. as is my wont. Best film in my region: the Piano. Best location, anyway, Karekare beach, ideal for moody skulking and childhood memories both. 5. Are you flirting with Rizzo? Why I oughta…. 4: Email them. Invite them back. Shame them into coming back. Whatever it takes. Maybe Facebook or G+ a post. It’s okay, you don’t have to do it for everyone; the rest of us will understand. Maybe some new people will click through. and where is Marley? he was a mainstay for a long while…. when ever i’ve FB’d TGW people end up commenting back on FB not on TGW. : – ( Monoblogculture I suppose. Oh nevermind. I zoomed in and there are a few. I was going to harrumph about it. If it weren’t for Mars Attacks! It would be even bleaker.